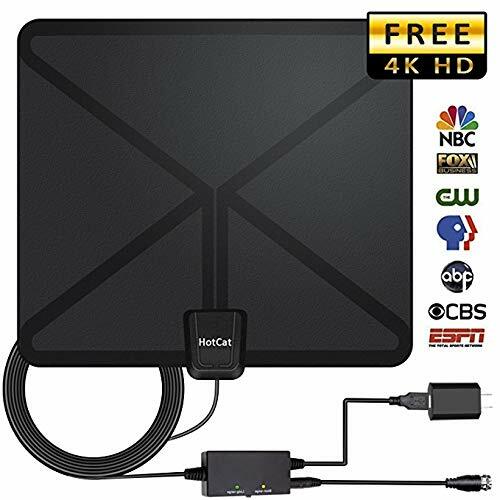 UPGRADED 2018 VERSION Indoor Amplified HDTV Antenna 60-90 Miles Range! 4) Connect the HDMI cable from the amplifier to the TV. 5) Input your TV and make sure it is set for TV. 6) Set for menu on your and make sure it is set for "air" or "antenna", whichever you TV menu has. 7) Go to "Scan for Channels" or "Channel Scan" etc., select "ok" and scan for the menu. Try different locations , put the antenna up as high as you can. Or close to the window. 90 Days Full Refund and Lifetime Warranty with friendly customer service! Now Choose HotCat Antenna and Cut the cable , enjoy FREE HD programs forever! 【High Performance Reception】2018 Newest Amplifier Signal Booster! Which update 5%-10% reception than old version. 60-90 Miles signal reception range, equip with new type switch control amplifier booster. Choose to use it or not according to your distance to the tower easily. Below 35 miles? Turn to the short range side! Above 35 miles? Turn the green light on!